Private Lessons | The leader in Ballroom dancing! 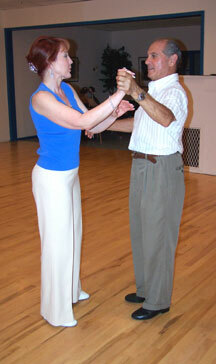 Private Lessons – The leader in Ballroom dancing! Are you ready to learn to dance? Discovering the fun of ballroom dancing is only an hour away when you have the skills of a professional instructor at your disposal. Pick one dance or an array of dances to learn – it’s your choice! It’s all up to what you want to learn when you schedule a private lesson. Many people find they learn more effectively with private lessons because they have the luxury of an instructor to themselves for an hour. With learning one-on-one the teacher can fix the student immediately if correct is needed. Or, if the student is learning fast, the teacher can instruct to the speed of the student. Lessons are available for beginners, those two left feet people, advanced dancers, people interested in performing or competing, and training students for medal exams or professional exams. Basically, we teach Beginners up to Professional Dancers. Lessons are typically arranged on an hourly basis. During that hour you can choose that dance you have always wanted to learn, or brush up on your leading or following skills, or prepare for that memory of a lifetime, or just be able to dance a little at the next party you attend. Whatever your goals, we can teach you in a relaxed environment and provide you a good plan to achieve those dreams you always had. Schedule one lesson or take a package of lessons. Contact the studio for prices today. Prices are available for hour lessons. Packages are also available. A package offers you the opportunity of saving money on your overall cost per lesson. Because of the discounted price, we do ask that you take a lesson once a week with a package. Please ask for details when scheduling your lesson. ~Private lessons are scheduled on an individual basis. We require a $15 deposit to hold your time for your lesson. Our time is just as precious as your is to you. There is a 24-hour cancellation policy in order to not forfeit your scheduled lesson. Canceling a lesson without a 24 hour notice will incur you the cost of the lesson. Thank you for your understanding.